This installation took four months to cut and build.It was inspired by a meeting with a group of microbiologists planning a new exhibition centre focusing on the Human Microbiome, that is the vast colony of bacteria that lives in and on our bodies. 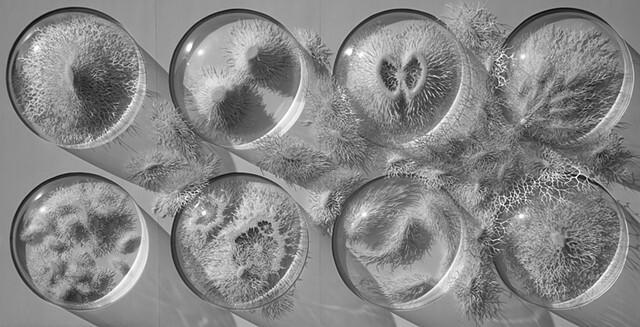 Fascinated by this hidden world I spent months researching the strange shapes and forms of microbes and pathogens. I wanted to create a piece that examined our fears of the microbiological world, so out of one of the petri domes a group of bugs burst forth, full of ferocious uncontrolable energy. When this piece was being exhibited in London in summer 2014, the ebola outbreak was dominating world news, a tragic coincidence.